CATHERINE MCNAMARA grew up in Sydney and moved to Paris to study French, and ended up in Ghana running a bar. She moved to Italy eight years ago. 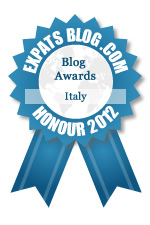 ExpatsBlog.com Expat Blog Awards 2012: Italy Honourable Mention Award! This blog won the Honourable Mention Award for best expat blog in Italy! Warm, intelligent bloggings! Love it! This is such a fun and varied blog - it conveys perfectly all the delights and frustrations of expat life, the daily wonder and bafflement, as well as profound understanding and love of Italy. Great post. As a fellow ex-pat, I find this funny and very, very true. Catherine is a poet in four-inch heels, and she always makes me laugh. Cat has it all! Warm intelligent insightful challenging and a fab laugh. She is grappa made flesh - an injection of espresso - a warm embrace - a friend! The writing is of such consistently high quality - the posts have you begging for more. At times hilarious and times poignant, Catherine's posts always give me something to think about. Catherine makes me think, laugh and question. Wonderful use of language and a different and interesting point of view. Fun to read and so very thought provoking! Catherine filters her experience of Italy through a veil of humour and observation in a way that makes you smile, but also makes you want to lift the veil and see the deeper motivations driving her. She makes you care for her and root for her.